The San Joaquin (sometimes referred to as San Joaquins) is a passenger train service operated by Amtrak in California's Central Valley. Seven round-trip trains a day run between its southern terminus at Bakersfield and Stockton, where the route splits to Oakland (five round trip trains per day) or Sacramento (two round trip trains per day). The route has an extensive network of dedicated Amtrak Thruway Motorcoach buses that are critical to the performance of the service. In 2016, over 55% of passengers used an Amtrak Thruway Motorcoach on at least one end of their trip. Buses are timed to meet trains and offer connections to points in Southern California (including Los Angeles Union Station where passengers can continue their journey on the Pacific Surfliner or Amtrak's long-distance trains), the city of San Francisco, the Central Coast, the North Coast, the High Desert (including Las Vegas), Redding, Reno, and the Yosemite Valley. The San Joaquin is Amtrak's sixth-busiest service in the nation and the railroad's third-busiest in the state of California. During fiscal year (FY) 2016, the service carried 1,122,301 passengers, a 4.7% decrease from FY2015. Total revenue during FY2016 was US$35,585,570, a 4.8% decrease over FY2015. Like all regional trains in California, the San Joaquin is operated by a joint powers authority. The San Joaquin Joint Powers Authority (SJJPA) is governed by a board that includes two elected representatives from each of eight counties the train travels through. The SJJPA contracts with the San Joaquin Regional Rail Commission to provide day-to-day management of the service and with contracts with Amtrak to operate the service and maintain the rolling stock (locomotives and passenger cars). The California Department of Transportation (Caltrans) provides the funding to operate the service and also owns the rolling stock. The San Joaquin runs over lines that once hosted several passenger trains a day. The top trains were the Golden Gate on the Atchison, Topeka and Santa Fe Railway (predecessor to BNSF), and the San Joaquin Daylight on the Southern Pacific Railroad (later acquired by Union Pacific). Prior to 1960s service cutbacks passenger service continued south of Bakersfield, to Glendale and Los Angeles. In April 1965 as ridership on passenger trains continued to drop, the Santa Fe Railway received permission from the Interstate Commerce Commission to severely curtail Golden Gate operations, with service finally abandoned three years later. The San Joaquin Daylight was discontinued with the start-up of Amtrak in May 1971. Other passenger trains that ran through the Central Valley included Southern Pacific's Owl and Santa Fe's San Francisco Chief and Valley Flyer. Amtrak routed all Los Angeles-San Francisco service over the Southern Pacific's Coast Line in its initial 1971 route structure, leaving the San Joaquin Valley without service. Both the Southern Pacific's San Joaquin Daylight and the Santa Fe's San Francisco Chief had served the region. Beginning in 1972 Amtrak revisited the decision at the urging of area congressmen, notably Bernice F. Sisk, who favored service between Oakland and Barstow or, failing that, Barstow and Sacramento. Service began on March 5, 1974 with one round-trip per day between Bakersfield and Oakland and a bus connection from Bakersfield to Los Angeles. The San Joaquin could not continue south of Bakersfield due to capacity limits over the Tehachapi Loop, the only line between Bakersfield and points south and one of the world's busiest single-track freight rail lines. Amtrak chose the Santa Fe route over the Southern Pacific, citing the higher speed of the Santa Fe–79 miles per hour (127 km/h) vs. 70 miles per hour (113 km/h)–and freight congestion on the Southern Pacific. The decision was not without controversy, with Sisk alleging that the Southern Pacific lobbied the Nixon Administration to influence the decision. In 1979 Amtrak proposed discontinuing the San Joaquin as part of system-wide reductions ordered by the Carter Administration. The state of California stepped in to provide a yearly subsidy of (then) $700,000 ($2.42 million adjusted for inflation) to cover the train's operating losses, and it was retained. 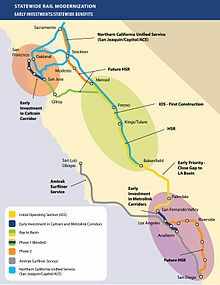 At the time the state asked Amtrak to add a second round trip between Oakland and Bakersfield, and to extend the service south over the Tehachapi Pass to Los Angeles. Amtrak added the second train in February 1980, but attempts to extend the train over the Tehachapi Loop failed due to Southern Pacific's opposition. A third round trip was added on December 17, 1989, followed by a fourth on October 25, 1992.:15 On May 16, 1999, Amtrak added a Sacramento–Bakersfield round trip - the fifth daily San Joaquin round trip. A second Sacramento–Bakersfield round trip was added on March 18, 2002, with a fifth Oakland–Bakersfield round trip added on June 20, 2016.:15 On May 7, 2018, the last southbound train was cut to Fresno, allowing it to become an early-morning "Morning Express Service" northbound trip to Sacramento. This change, which allowed same-day trips to Sacramento for the first time, was expected to result in increased ridership from business travelers. :34 However, it was criticized by Bakersfield-area officials because it reduced daily service to Bakersfield by one daily round trip. The SJJPA plans to evaluate a proposal from those officials to instead originate the train in Bakersfield, but skip many intermediate stops to allow arrival in Sacramento for business hours. :30 The service is expected to be suspended and reverted to its previous time slot on May 6. Counts indicated ridership at 50 people compared to 130 with the old timetable. The two additional Sacramento round trips will be routed over the Union Pacific Railroad Sacramento Subdivision north of Stockton. Unlike the current route on the Fresno Subdivision, the Sacramento Subdivision has spare capacity to allow the increased service. :27 Six new stations will be added at Lodi, Elk Grove, three locations in Sacramento, and Natomas as part of a joint expansion with Altamont Corridor Express (ACE). The Sacramento Subdivision trains will not serve the existing Sacramento Valley Station, but RT Light Rail connections and a shuttle bus to Sacramento International Airport will be available. :27 Sacramento service will be supplemented by ACE commuter service, starting with an extension from Stockton to Natomas over the Sacramento Subdivision route. A branch from Stockton to Ceres over the existing San Joaquin routing will be added in 2023 and extended to Merced in 2027. For its first two years of operation the San Joaquin used single-level coaches Amtrak had inherited from other railroads. In October 1976 Amtrak introduced new Amfleet coaches to the service. From 1987-1989 Amtrak used Superliner and ex-ATSF Hi-Level coaches. For a short period beginning on June 15, 1987, this included a full dining car on one of the trains. Amtrak reequipped the San Joaquin trains again in 1989, this time with new Horizon coaches, when service expanded to three daily round-trips. The San Joaquin began receiving the Superliner-derived California Cars that it uses today in 1995. Amtrak California operates its own fleet of EMD F59PHI, GE P32-8WH and Siemens Charger locomotives that are used on San Joaquin trains. These locomotives are owned by Caltrans and carry its CDTX reporting marks. Amtrak owned locomotives are also occasionally used on the San Joaquin, including the P42DC. The San Joaquin is equipped with Amtrak California's fleet of California Car bi-level, high-capacity passenger cars owned by the California Department of Transportation (Caltrans). Each trainset typically consists of two coach cars, a coach/baggage car, a café (dining) car, and a cab/coach car. The cab/coach car is a similar to other coaches but with an engineer's operating cab and headlights on one end, allowing the train to be operated in push-pull mode, which eliminates the need to turn the train at each end-point. Caltrans is in the process of refitting the cab/coach cars to have a space on car's lower level for storage for checked luggage and bikes. Caltrans also owns several Surfliner bi-level cars that are used on some San Joaquin trainsets. The newer cars look very similar to the California Car fleet, but feature reclining seats, open overhead luggage racks and a restroom on the upper-level of each car. In 2007 Caltrans paid to repair several wreck-damaged Superliner I coaches in exchange for a six-year lease of the Amtrak owned cars that are normally used on long-distance trains. Four of these cars are painted to match the California car livery and often appear in service on the San Joaquin route in place of a coach/baggage car. Increasing ridership on the San Joaquin led Caltrans to purchase 14 Comet IB rail cars from New Jersey Transit in 2008 for $75,000 each. The former commuter cars were refurbished and reconfigured by Amtrak's Beech Grove Shops to serve as intercity coaches at a cost of approximately $20 million. The refurbished cars have reclining inter-city seats with tray tables (4 per row), AmtrakConnect WiFi, two power outlets at each seat pair, luggage racks, trash/recycling bins, a restroom, and 6 workstation tables in the center of the car. 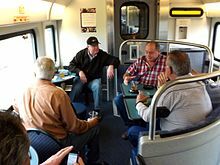 Caltrans has also paid to lease and refurbish 3 Non-Powered Control Units (F40PH locomotives converted into cab/baggage cars) and 3 Horizon Dinettes to serve as café cars (using the same equipment as other Amtrak California trains). These single-level cars will be used to create two Comet Car trainsets that will run between Oakland and Bakersfield. This will allow Caltrans to break up two bi-level California Car trainsets and use the cars to add another coach car to each of the San Joaquin's remaining California Car trainsets. Caltrans had planned to use the Comet Car trainsets on trains starting in July 2013, but the refurbishing process took longer than expected. The first Comet Car trainset was put into regular service on October 21, 2013 and the second trainset was put into regular service on April 15, 2014. The San Joaquin runs from Bakersfield's Truxtun Avenue station northward on BNSF Railway's Mojave Subdivision within Bakersfield, the Bakersfield Subdivision from Bakersfield to Calwa (Fresno), then on the Stockton Subdivision from Calwa to Stockton. The Oakland trains continue west on the Stockton Subdivision to Port Chicago. At Port Chicago they cross to the Union Pacific Railroad's Tracy Subdivision to Martinez, continue on the Martinez Subdivision to Emeryville, and finally travel a few miles on the Niles Subdivision to Oakland's Jack London Square station. Trains to the Sacramento Valley Station diverge in Stockton and run north to Sacramento on Union Pacific's Fresno Subdivision and on the Martinez Subdivision within Sacramento. When the Central Valley segment of California High-Speed Rail (HSR) is completed in 2019, there are plans for the San Joaquin to use the HSR infrastructures if the construction to San Jose is severely delayed. The route is the sixth-busiest Amtrak route in the nation. Owing in large part to this, Bakersfield is the 23rd-busiest Amtrak station in the country, and one of the busiest serving a metro area of fewer than 2 million people. The San Joaquin has an extensive network of dedicated Amtrak Thruway Motorcoach buses. Over 55% of passengers on the route used an Amtrak Thruway Motorcoach on at least one end of their trip. Sacramento Valley Station Sacramento ● 1999 present California Zephyr, Capitol Corridor, Coast Starlight, Sacramento RT Light Rail connections are available to Redding, Reno via South Lake Tahoe, Oakland, and San Francisco. Stockton – Robert J. Cabral Station ● 1999 present Altamont Corridor Express connections are available to San Jose, Redding, and Stockton – San Joaquin Street. Emeryville ● 1993 present California Zephyr, Capitol Corridor, Coast Starlight connections are available to a number of points in the city of San Francisco. Martinez ● 1974 present California Zephyr, Capitol Corridor, Coast Starlight connections are available along the North Coast, to Napa, Santa Rosa and McKinleyville. Stockton-San Joaquin St San Joaquin ● 1974 present connections are available to San Jose, Redding, Sacramento, Lodi, and Stockton – Robert J. Cabral Station. Merced Merced ● ● 1974 present connections are available to Yosemite National Park. Fresno Fresno ● ● 1974 present connections are seasonally available to Yosemite National Park. Hanford Kings ● ● 1974 present connections are available to the Central Coast and Visalia. Bakersfield ● ● 2000 present connections are available to a number of points in Southern California (including Los Angeles Union Station where passengers can continue their journey on the Pacific Surfliner or Amtrak's national network of trains), the High Desert (including Las Vegas), and the Central Coast. ^ Amtrak's Great American Stations website gives "early 1978" as the start of San Joaquins service at Richmond. The station is listed as a stop for all three trains in the January 8, 1978 and April 30, 1978 Amtrak timetables. ^ a b c "Amtrak Fact Sheet, Fiscal Year 2017: State of California" (PDF). November 2017. p. 5. Retrieved May 11, 2018. ^ a b "Draft 2017 Business Plan Update" (PDF). San Joaquin Joint Powers Authority. p. 3. ^ "Amtrak FY16 Ridership & Revenue" (PDF). Amtrak. November 2017. Retrieved May 11, 2018. ^ Sheehan, Tim (June 26, 2015). "Valley agency takes control of Amtrak San Joaquin trains". Fresno Bee. Retrieved February 11, 2016. ^ "1958 SP Passenger Timetable". my ESPEE MODELERS ARCHIVE. December 9, 2000. Retrieved June 10, 2016. ^ a b "Amtrak Sets Ridership Record and Moves the Nation's Economy Forward" (PDF) (Press release). Amtrak. October 14, 2013. Retrieved June 10, 2016. ^ a b "Amtrak FY15 Ridership & Revenue" (PDF). Amtrak. June 29, 2016. Retrieved May 11, 2018. ^ "Amtrak Fact Sheet, Fiscal Year 2016: State of California" (PDF). November 2016. p. 5. Retrieved May 11, 2018. ^ "Vital need for passenger train". Oxnard Press-Courier. May 5, 1971. Retrieved December 31, 2012. ^ "Press release announcing the launch of the San Joaquin, 1974". Amtrak. March 5, 1974. ^ Cook, Gale (March 10, 1974). "San Joaquin Valley Amtrak route draws some tart comments". Modesto Bee. Archived from the original on January 24, 2013. ^ "Fixup funds are part of service proposal". Merced Sun-Star. March 21, 1980. Archived from the original on January 25, 2013. Retrieved January 1, 2013. ^ "'San Joaquin' trains catching on". Merced Sun-Star. July 30, 1982. Archived from the original on January 24, 2013. Retrieved January 1, 2013. ^ a b c d e f g h i j k "2018 Business Plan Update" (PDF). San Joaquin Joint Powers Authority. 2018. ^ "San Joaquins". Amtrak. Retrieved 7 May 2018. ^ "Caltrans Increases Service" (PDF). Intercity Rail Passenger Systems Update (6): 11. December 1999. ^ Burger, James (September 14, 2017). "Amtrak reducing service from Bakersfield, shifting a train north in search of business travelers". Bakersfield Californian. ^ Holland, John (5 April 2019). "Amtrak added a train to Sacramento for commuters in Modesto area. What went wrong?". The Modesto Bee. Retrieved 14 April 2019. ^ "San Joaquin Joint Powers Authority Draft 2019 Business Plan Update" (PDF). San Joaquin Joint Powers Authority. p. 9. ^ a b Bizjak, Tony (4 October 2017). "Catch an Amtrak toward L.A. from midtown Sacramento? Train officials propose new service". Sacramento Bee. Retrieved 7 May 2018. ^ Holland, John (27 April 2018). "Expanded train service coming to Modesto, Merced; what it means for commuters". Modesto Bee. Retrieved 28 April 2018. ^ "VALLEY RAIL PROJECT RECEIVES MAJOR GRANT FUNDING TODAY BY STATE" (Press release). San Joaquin Joint Powers Authority. April 26, 2018. ^ "Amtrak will introduce new rail cars". Los Angeles Times. October 18, 1976. p. B17A. Retrieved December 31, 2012. ^ "Amtrak ridership up on San Joaquin line". Lodi News-Sentinel. February 21, 1987. Retrieved December 31, 2012. ^ "Valley gets added service". Lodi News-Sentinel. December 18, 1989. Retrieved December 31, 2012. ^ Cabanatuan, Michael (June 23, 1995). "Sleek train debuts". Modesto Bee. Retrieved December 31, 2012. ^ a b c San Joaquin Joint Powers Authority/Caltrans. "San Joaquin Rolling Stock Presentation" (PDF). pp. 35–42. Archived from the original (PDF) on November 5, 2013. Retrieved June 30, 2013. ^ "San Joaquin Trains 711 and 718: Operate with Refurbished Equipment" (Press release). Amtrak. Archived from the original on October 24, 2013. Retrieved October 22, 2013. ^ "Richmond, CA (RIC)". Great American Stations. Retrieved November 24, 2017. ^ Amtrak National Train Timetables. Amtrak. January 8, 1978. pp. 43–46 – via Museum of Railway Timetables. ^ National Train Timetables. Amtrak. April 30, 1978. pp. 43–46 – via Museum of Railway Timetables. Rail Passenger Development Plan: 1988-93 Fiscal Years. Sacramento, CA: Division of Mass Transportation, Caltrans. 1988. OCLC 18113227. Solomon, Brian (1999). Southern Pacific Railroad. Osceola, WI: MBI Publishing Company. ISBN 0-7603-0614-1. Wikimedia Commons has media related to San Joaquin (train).